Mezzanines are a cost effective solution to add additional capacity to a warehouse or distribution center by utilizing vertical space. They are typically more affordable than building renovations and can adjust as your operations grow. 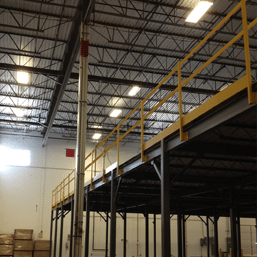 Mezzanines can be designed to meet specific framing options, safety codes, access point requirements, flooring types, and product loading and unloading operations. 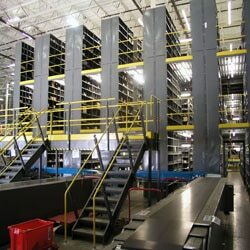 Additionally, a mezzanine design takes into account all possible load requirements including dead loads (anything permanent on the mezzanine) and live loads (pallet jacks, people standing and walking, etc.). Also known as a structural mezzanine, free standing mezzanine allows for maximum use of floor and mezzanine level space. It provides easy assembly and disassembly and the wide-span design allows traffic flow under platform. It is ideal for parts and product storage as well as conveyor support. 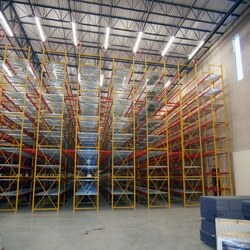 REB Storage Systems International has more than 50 years of experience designing and installing mezzanine systems in warehouses and distribution centers. Our vast experience makes us able to assess the needs of any space and determine which type of mezzanine is ideal to provide you with a mezzanine that is the right solution for your needs. 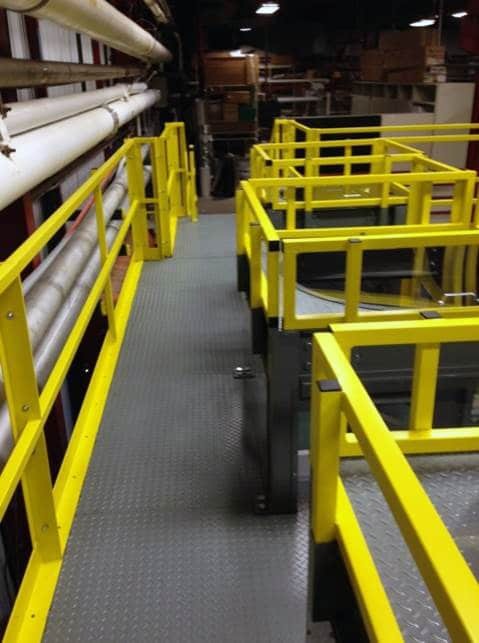 REB will incorporate proper components to optimize mezzanine operations and safety. Flooring: Choose from resin board, corrugated decking, bar grating, open steel planking, and concrete. Staircases: Numerous models and options available including number of rails, angles, risers, tread, and step width. Ladders: Ladders are designed for safe travel throughout the mezzanine. Handrails: Handrails are designed to keep employees safe. Gates: We can incorporate gates into your mezzanine to expedite proper material handling. Options include single swing gate, double swing gate, sliding gate, lift-out safety gate, and safety pivot gate. Conveyors: To help product move efficiently to and from the mezzanine level. 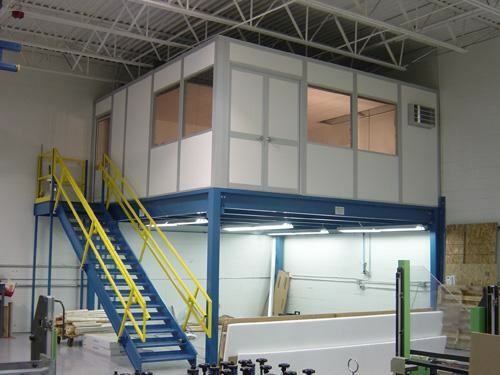 Modular Office: Integrating a self-standing mezzanine with a modular office and fixed windows can create additional production space on the ground floor while overseeing the warehouse operations from above. DO YOU NEED A MEZZANINE? If you need a complete mezzanine system, we can help. 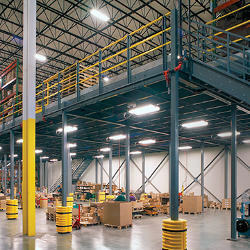 We've been creating mezzanines in warehouses and distribution centers for more than 50 years.